After spending 13 nights on board our vessel exploring this wonderful part of the world, we are certain our guests will leave Antarctica with a completely different perspective than when they arrived. After all, it would be impossible to feel quite the same after gazing upon an unimaginable profusion of penguins tobogganing and waddling their way across the snow – or watching yet another species of whale crest the waves in close proximity. And then there is the awe you will feel when you first glimpse the sweeping ice sheet that spans an entire continent. Antarctica gets under your skin unlike any other place on earth. We all experience a deep sense of awe when we first glimpse the much-anticipated continent. Even David, with 12 previous photo expeditions to the frozen continent, is still overwhelmed by its formidable beauty and size. We are greeted by thousands of icebergs that look like modern art sculptures lining the bays of Paradise Harbour or Hope Bay. Meanwhile an overwhelming profusion of wildlife is on display from penguins torpedoing through the water to predatory leopard seals staking their claim on ice floes. We hope to stand on the mainland of the White Continent itself. From this vantage point, it is easy to understand why legendary explorers such as Roald Amundsen and Sir Ernest Shackleton were so captivated by this haunting region. As with all our voyages, safety is our top priority. For that reason weather, ice or other conditions may require us to change our itinerary and shore excursions as we go but that is half the fun of Polar exploring. Predictability is a word that has no relevance in this environment and is especially relevant to photography. Today is the first day of our adventure. As we board the vessel in Ushuaia, the world’s southernmost city near the tip of Argentina, and start to become familiar with ‘our home’ for the next 18 days we cannot help but wonder about the exciting journey ahead of us. In the early evening, we set sail and begin our voyage leaving behind Ushuaia and charting a course through the Beagle Channel. We’ll be up early and after breakfast will start by attempting to photograph the numerous sea birds that are sure to be following in the wake of our ship. This is not an easy task and will be sure to test the focusing skills of even advanced photographers. No worries as there will be plenty of opportunities and David will be on hand to make suggestions and to critique your photos as you go. Crossing the Drake Passage, there is so much excitement in the air as we make our way ever closer to the white continent. Guests eagerly soak up the friendly atmosphere onboard as our numerous Polar experts prepare us for our adventures with presentations on everything Antarctic, from wildlife to history. David will give presentations and will be available to answer any photo questions along the way, getting you prepared for when we reach the peninsula. Eventually, we will cross the Antarctic Convergence where we will notice a distinct drop in temperature as we enter the waters of the Antarctic Ocean. Along the way, we will witness many spectacular sights from icebergs to an array of seabirds and even several whale species some of which are known on occasion to fully breach from the sea. In the waterways of the Antarctic Peninsula, we will hope to make as much time as possible to explore by inflatable Zodiac boats and marvel up close at nature’s glory. Our first goal will be to sail south of the Antarctic Circle and into Matha Strait or Marguerite Bay. Given favorable ice conditions, we will push our exploration even further southward, looking for historic and wildlife sites to train your cameras on. 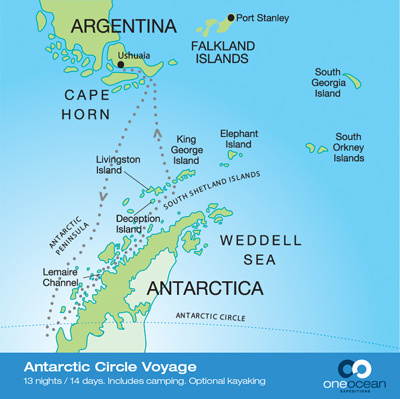 From our most southerly point (south of the Antarctic Circle), we will make our way north along the Antarctic Peninsula, cruising through the narrow waterways and channels of the Antarctic Peninsula. Spectacular waterways such as Crystal Sound, the Lemaire Channel, the Neumeyer Channel and the Gerlache Strait will all feature in our itinerary. The icebergs, glaciers and mountains in this area are as impressive as anywhere we’ll visit so be ready with the cameras for the unexpected photo opportunities. Landing sites might include Neko Harbour, Wilhelmina Bay, Petermann Island and the Yalours, where we will observe Weddell, crabeater and elephant seals, skuas and other seabirds as well as an abundance of penguins including some very large colonies of the comical Adelie penguin. At Half Moon Island we will visit a breeding colony of chinstrap penguins that share their territory with fur seals and blue-eyed shags. We also hope to see the gentle humpback whale dining on krill in its feeding grounds and possibly have an opportunity to spot orcas and Minke whales as we go. We will plan on walking ashore on the continent of Antarctica at Paradise Harbour or Neko Harbour. Although it will not be your first glimpse of the Antarctic, a walk ashore on the Continent will evoke emotions to carry with you for the rest of your life. The scenery here is amazing. In particular the oddly shaped icebergs looking like sculptures, as well as the colossal ‘tabular’ icebergs that break away from the continent’s ice shelf. Some may wish to camp on shore overnight. Whatever your vantage point, whether it is onboard or onshore expect to feel transformed as you experience twilight from the very bottom of the planet. As we leave this magical place and make our way back across the Drake Passage. This is a good time to catch up on photo editing and if time allows David will give a presentation on basic Photoshop techniques to polish off your treasures. We have no doubt that time will be spent sharing and reflecting on the wonderful experiences of the last few days and sharing some of your images with each other, including photos you may have captured of each other. After rounding the infamous Cape horn well sail up the Beagle Channel where we celebrate the conclusion of our Polar expedition at a special dinner. In the early morning, we will arrive back in Ushuaia. It is time to say farewell to David your crew and fellow travelers. Guests will be transported to their hotels or to the airport for return flights home. Lenticular clouds forming about the Antarctic Peninsula. An Adelie Penguin posing posing atop an iceberg. Icebergs and glaciers along the Antarctic Peninsula. Price based on cabin selection. Click here for descriptions. Please email us for more information on reserving your spot or with any questions. Thanks! David’s personal instruction prior to and during the tour. Regular image review during the photo tour as time allows. End of voyage recap slide show and voyage log notes. We will be available and happy to answer all your questions, prior to and after booking. This expedition is operated by One Ocean Expeditions a company David has sailed and worked with many times over the years in both Antarctica and the Arctic. David will be the Expedition’s Photographer in Residence. We’ll be sailing on the ship Akademik Ioffe. Click here to see a larger view and specifications.